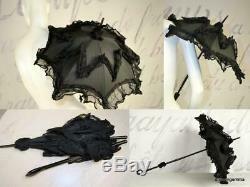 Antique vintage Victorian black silk parasol umbrella small folding carved wood. This beautiful parasol measures about 27 1/2 long when handled is extended, the canopy is closed and lying flat. When open, the canopy measures approx 16 3/4 across. This is working and complete. There are a few tears on the top layer of the canopy. The underside layer appears to have no splits. FOR THOSE PURCHASING NEW ITEMS. MOST ITEMS ARE NEW CONDITION, HOWEVER, MAY HAVE BEEN TRIED ON OR EVEN BRIEFLY WORN. CONDITION ISSUES IF FOUND WILL BE NOTED IN THE DESCRIPTION. FOR THOSE PURCHASING VINTAGE AND/OR PREOWNED ITEMS. SUCH ITEMS ARE FOR THOSE TREASURE HUNTERS THAT DESIRE THE CHARACTER AND UNIQUENESS OF BYGONE ERAS, OR ARE SEEKING AN ITEM NO LONGER PRODUCED, AND WILL SETTLE FOR A PRE-OWNED EXAMPLE. VINTAGE AND PREOWNED ITEMS MAY NOT BE PERFECT AND ONE MAY AT TIMES EXPECT MINOR IMPERFECTIONS. EXCELLENT CONDITION MEANS STRONG, BEAUTIFUL, AND WEARABLE, BUT POSSIBLY WITH THE SUBTLE CHARACTER OF AGE OR WEAR. 5-star ratings are what I strive and work hard for. I describe all items to the best of my ability so if you find something not as described it would be an honest mistake so please allow me the opportunity to correct it. Descriptions of clothing vary as do opinions and monitor color representations so please keep that in mind when purchasing over the internet. Thanks so very much for considering my items. Please note measurements are taken erring on the generous side of the tape measure so that if you require alterations, they would be to be taken in, and not let out. Please consider the measurements, the way it fits our mannequin if used in the listing (female mannequin measures a 35" bust, 25" waist, and 35 hip), and compare to garments you already own and are happy with the fit. Finally, if you have questions, please ask them before purchasing. Your item comes from my non-smoking and pet free establishment but I cannot guarantee the history of the original place of storage. Just drop me a note saying so. Thanks so much for shopping with me! Please do not ask to have that information changed to "gift" or to have the value lessened. Vintage has character and patina that will make it unlike a brand new modern item. I try to describe any major issues or flaws but may miss the most tiny flaw. Colors, fabrics, and such are described to my best ability but our opinions may differ as can computer monitors. I only describe things how I see them and would never mislead a customer on purpose. If you are looking for items to be in mint pristine condition then vintage may not be suited to you. Finding a tiny spot or a loose seam etc. Please contact me with any issues so that I may have the opportunity to best serve you. Most of my items are vintage and probably used. Unless I claim the item is "mint" then please expect minor imperfections or signs of age. I try very hard to examine everything but I could miss something minor. I attempt to describe all aspects of the things I sell and I take several pictures to give you accurate information. Hello, I love to hunt for the most interesting things but I can't keep it all! My background is in fashion and I love art however if I find a unique object of any kind you might find it here! I sort through estate basements, closets, and attics of central Ohio to uncover the treasures of fashion. Please look me up often to see what is being unveiled! Your satisfaction is my top priority as I want you to have a pleasant shopping experience. Please contact me with any comments, concerns, questions, or complaints right away so I may do my very best to assist you. Get Supersized Images & Free Image Hosting. Create your brand with Auctiva's. Attention Sellers - Get Templates Image Hosting, Scheduling at Auctiva. The item "Antique vintage Victorian black silk parasol umbrella small folding carved wood" is in sale since Tuesday, March 19, 2019. This item is in the category "Clothing, Shoes & Accessories\Vintage\Vintage Accessories\Umbrellas & Parasols". The seller is "the_material_girl" and is located in Dublin, Ohio. This item can be shipped to United States, Canada, United Kingdom, China, Germany, Japan, France, Australia, Taiwan, Thailand, Belgium, Hong Kong, Ireland, Austria, New Zealand, Singapore, United arab emirates.